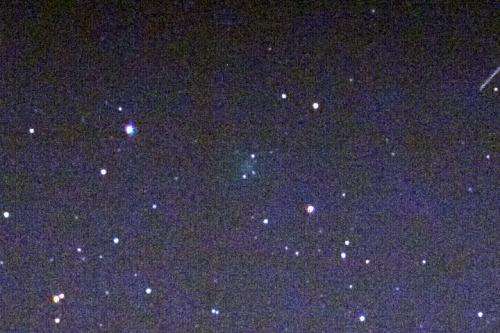 Friday, February 10th 2012 just felt like the perfect night for a comet to be discovered by an amateur astronomer, writes Fred Bruenjes on his astronomy blog. And, this past Friday night, thats exactly what Fred did. Using custom-written software to operate a 14″ Meade LX200GPS telescope in his self-built observatory in Warrensburg, Missouri, Fred set his system up to capture images of the sky on that cold evening, not allowing himself to be chased inside by the low temperatures or the bright, rising moon. After some technical difficulties with his dSLR, Fred managed to acquire some quality images. While making a cursory look through the blink data, Fred was surprised to spot a faint burry object visible moving across three frames. A check of online databases of known objects brought up no positive hits  this was something that hadnt been seen before. Still, Fred notes, it wasnt a slam-dunk. The images were faint and there could have been other causes of blurry spots in digital images. 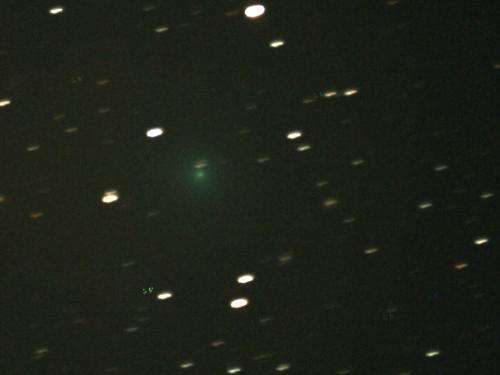 But a check of the raw color data revealed a greenish coloration to the objects glow, which is indicative of cyanogen and carbon emission  typical hallmarks of comets. Very encouraging, Fred added. the same faint, fuzzy green blur from the previous night, slowly appearing in the darkening sky right where it should be. Fred spent the next hour gathering images to send in to the IAUs Minor Planet Center, in the hopes of having the object cataloged so that others could locate and observe it. He didnt have to wait long; within five minutes the object was listed on the Near-Earth Object Confirmation Page, and dubbed C/2012 C2 (Bruenjes), in honor of its discoverer. Now thats just got to feel good. the official report isnt out yet. It appears to have a fairly inclined orbit relative to the ecliptic, based on the current diagram created by JPLs Small-Body Database. Stay tuned for more updated information on this newly-discovered member of our solar system. And congratulations to Fred Bruenjes, comet-hunter extraordinaire! Read Freds full story on his astronomy site here. Wow. Great job Fred. I love to watch a video about it. The universe always intrigues me.